SatTrackCam Leiden (b)log: Clear skies continue! The series of clear frosty skies is continuing here. Following my last report on December 22nd observations, I have been able to do more observations on the 26nd, 27th and 29th, plus a number of deep-sky guided astrophotography sessions. But first the satellites. Captured targets on these nights were Lacrosses 3 & 4 (97-064A & 00-047A), the NOSS 3-4 rocket (07-027B), which is still slowly variable, and the NOSS 3-2 duo (01-040A & C). 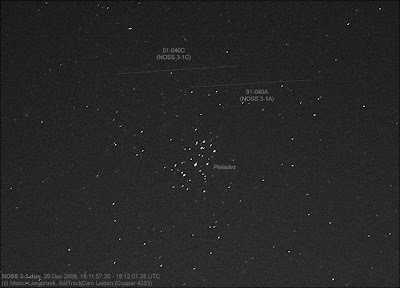 Yesterday, I slao shot this photograph of the open star cluster M35 in Gemini. It is a stack of 65 x 10s images, taken with the Canon EOS 450D piggyback on my Meade ETX-70. Lens was the same EF 50/2.5 (at F2.8) I use for the satellite imagery, and ISO was set at 1200. 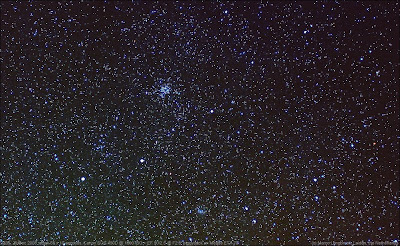 I used an image of the Pleiades shot the evening of the 25th to glean some more indications of the astrometric positional accuracy of the EF 50/2.5 lens. 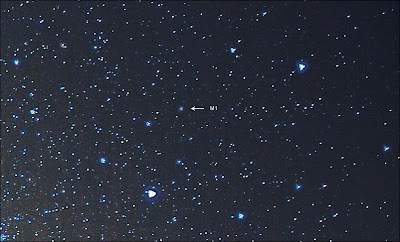 The stacked image contains several asteroids up to mag. +12 (10 Hygiea, 21 Lutetia, 94 Aurora, 182 Elsa and 264 Libussa), and by measuring these in Astrometrica (highly accurate astrometric software I use for my asteroid searches in NEAT data) and comparing to the predicted positions, it turns out that the positional deviations are typically within 5" (that is arcseconds). That is the same accuracy AstroRecord (the wide field astrometry software I use for my satellite images) indicates from the fit to the reference stars. So it is the timing uncertainty which is the main cause of uncertainty in my satellite positions.